It's hard to believe my baby just turned eight. She really doesn't appreciate being called "my baby," but that's what she'll always be - my sweet little girl, even though she's not so little any more. Second grade has been a good year for her. She's developed into a great thinker - whether it is mathematical problem solving, spelling patterns or reading fourth grade level books - she does a super job. Each day she is getting better at controlling her temper and remembering that it's more important to be a good friend than it is to get your way all the time. I'm so proud of her. And I love that even though she's eight, she still wants me to tuck her into bed every night. 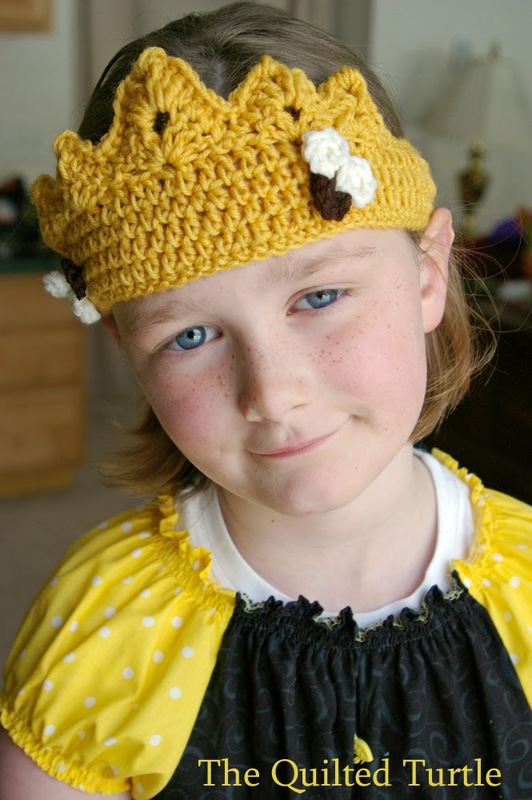 For her party, I made the bee dress and our friend, Miranda, whipped up that adorable crown - Her Majesty didn't take off off all day. You should have seen her face light up when she saw her place at the table. Plus we tried to call her things like "Your Majesty," "Your Ladyship" and "Your Highness" pretty much all day long. Each time we did it we got the look, but I know she secretly loved it. 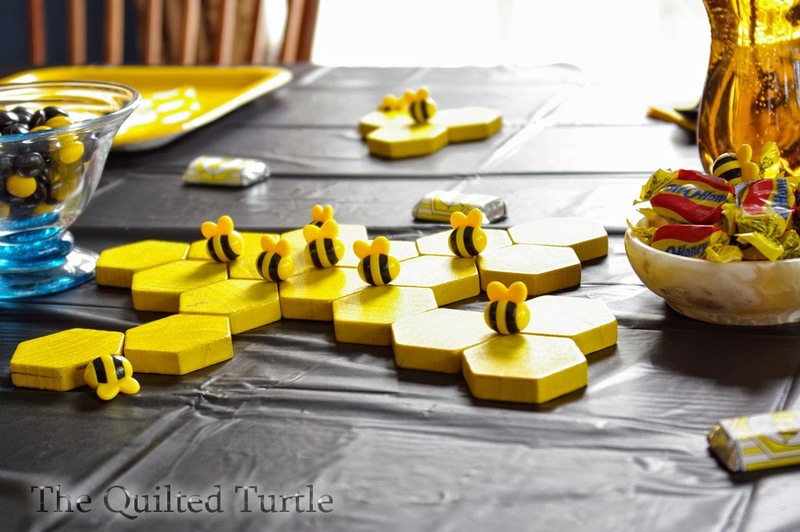 However, borrowing the yellow hexagon pattern blocks from school and raiding our Honey Bee Tree game for free table decorations was quite clever. 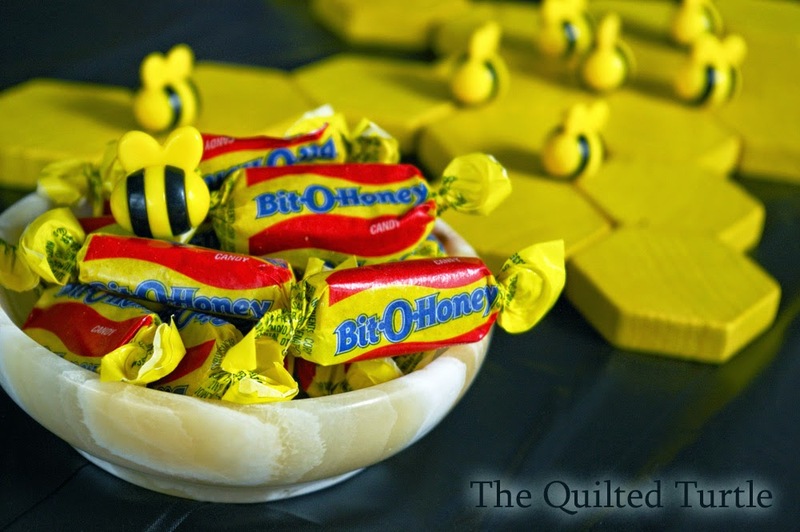 And, of course, what bee themed party would be complete without one of Grandpa's favorite candies? 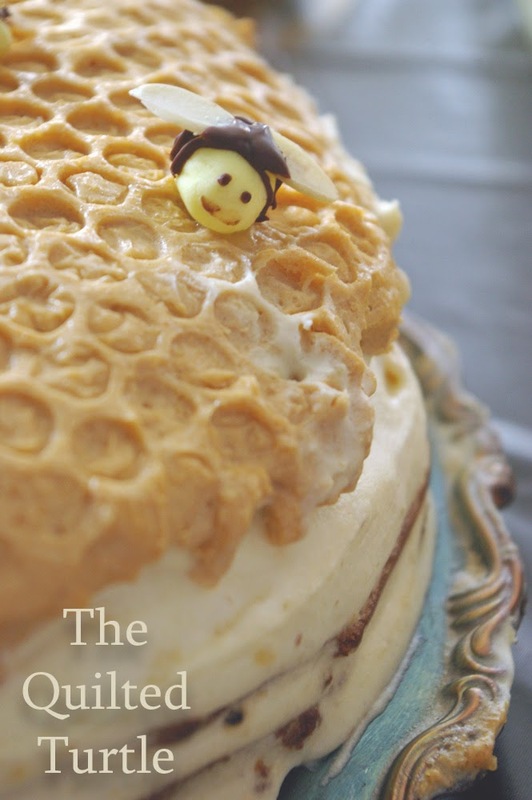 As usual, Allen made the cake. (He found it here.) He made a few changes and described his result as, "A complete fail," but I disagree. 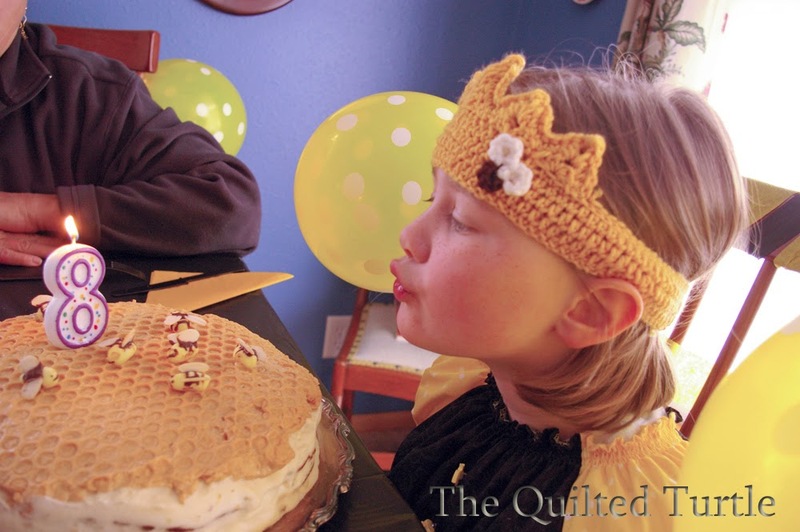 It looked cute and was really good, though I don't think it was sweet enough for the Queen. (Allen says that if he made it again he'd decrease the amount of cocoa by one or two tablespoons, and increase the amount of sugar in the pastry cream. That said, it was delicious with my coffee this morning.) In the cooking department, I got off easy this year. K requested chicken nuggets, french fries, green bean casserole and honey buns for dinner. As a rule we do not eat chicken nuggets and french fries at home - ever. But what the Queen wants on her birthday, the Queen gets. 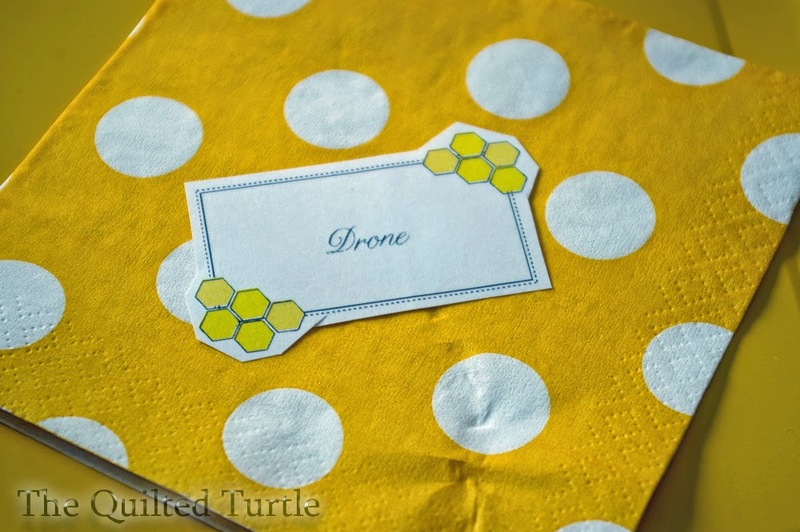 Find free bee party printables here, here, here, and over here. The garland I used came form here. 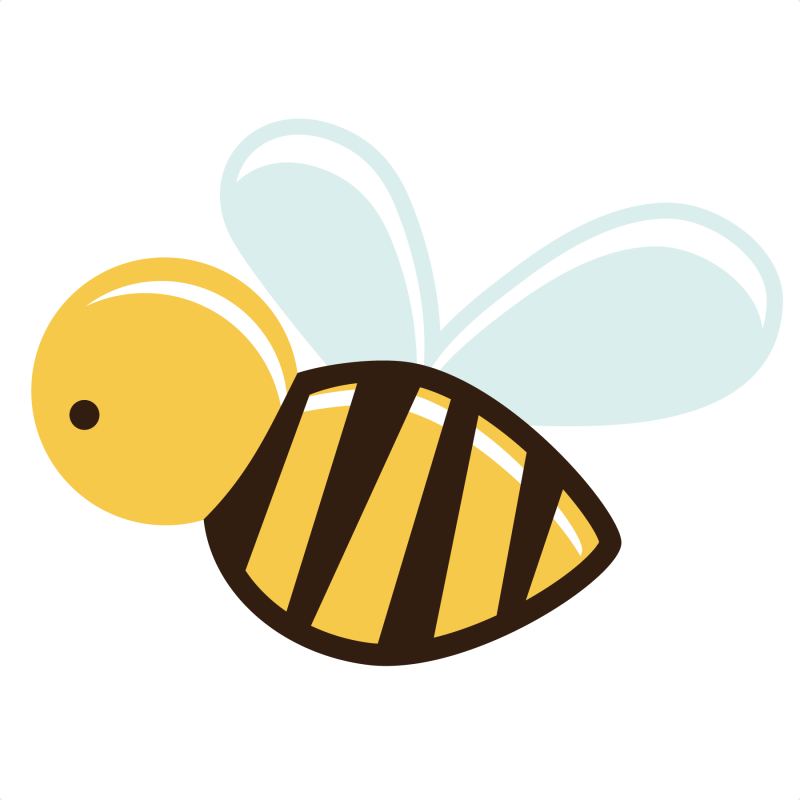 Some cute bee fonts can be found here and here. I found the background of my nectar labels here and the little bee here. 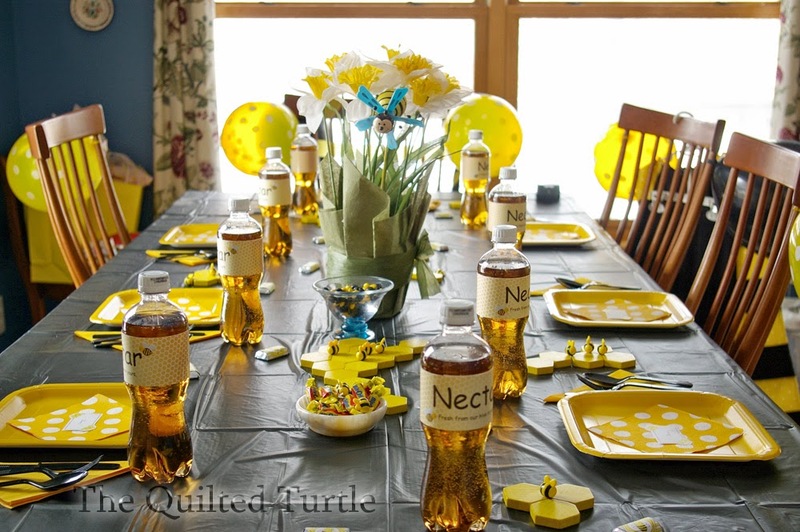 What a beautiful and creative birthday party. 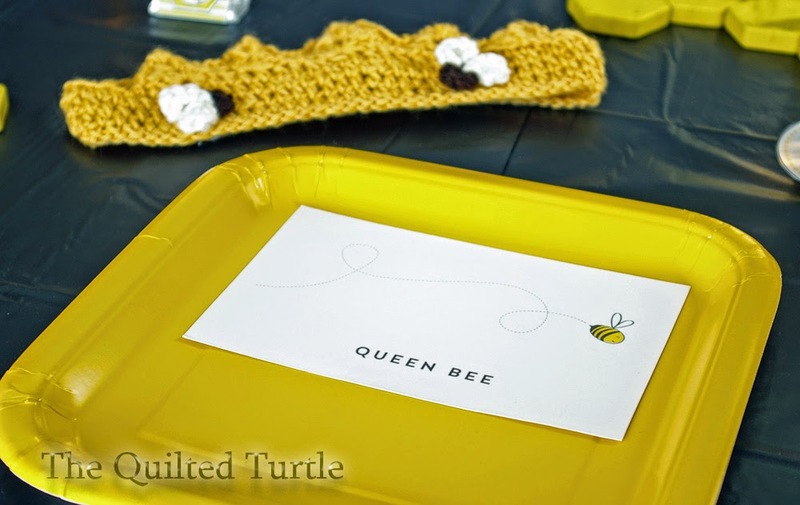 It all looks fit for a "queen" bee.